Reservations are required for all tours, with the exception of the Self-Guided tour of the San Bernard Oak Trail. You can sign up for tours at the Information Booth. All shuttle vans and tours depart from and return to the Van Stop near the Information Booth. You can find the shuttle and tour schedules ​​here. 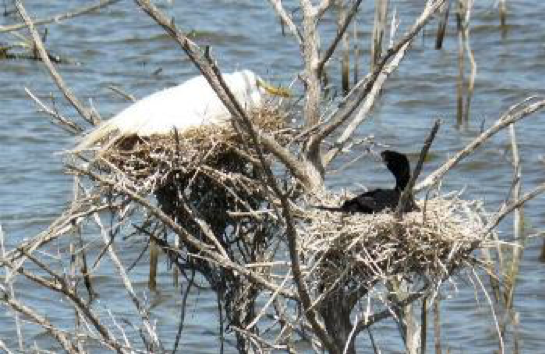 This one-hour event (40 minutes on the water) is led by naturalists on Cedar Lake Creek, a bayou that forms the western boundary of parts of Brazoria County and of the San Bernard National Wildlife Refuge. Much of this stretch of the creek is forested, although some sections are prairie, so the wildlife spotted can be quite diverse and includes raptors. Participants must be 18 years of age or older, or if 13 to 18, must be accompanied by a responsible adult. Reservations are required. Sign up at the ​​Information Booth to reserve a time slot. The Kayak Dock shuttle van will depart from the Van Stop 1/2 hour before each scheduled kayaking time slot. Each cruise will begin with instructions on basic kayaking technique and safety practices. • A life vest will be issued to each participant. • Shoes are required. Participants will get their feet wet, and should plan their footwear accordingly. • Participants should pack valuables (electronics, car keys, cell phones, cameras) in waterproof packaging, or arrange to leave these items ashore. • Binoculars, sunscreen, hats, insect repellent, and long-sleeved shirts are recommended. Marsh Buggy Tours are in high demand, and are limited in capacity and go fast! We recommend you arrive early at the Information Booth to secure tour passes. Vans shuttle guests to and from the Wolfweed Reservoir area where you transfer to a Marsh Buggy. Visitors embark on an exciting tour on the levees of the reservoir and through a portion of the marshy area of the reservoir. ​The driver/naturalist will help you identify the things you see. Alligators, various birds (especially Colonial Nesting Herons, Egrets, and Roseate Spoonbills), Raccoons, Feral Hogs, and other wildlife may be observed on your tour. Binoculars, sunscreen, and mosquito repellant are recommended. An experienced naturalist acts as your driver and guide on this is interesting tour of the Moccasin Pond driving loop and rail road. The tour requires a little more than an hour, and passes several freshwater marsh areas of the Refuge. Visitors are likely to see Alligators, Turtles and several bird species including Moorhens, Coots, Grebes, Egrets, Herons, Blue-Winged Teal. You also may see Bitterns (American and sometimes Least), Purple Gallinules, Snakes and some mammals (Raccoons, Bobcats, and Deer). Bring binoculars for a closer view. If you don't own binoculars, we will have simple binoculars available for your use. 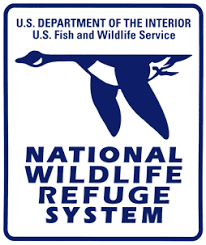 This tour is a wonderful introduction to the part of the refuge that is open to the public every day from sunrise to sunset. ​Self-Guided Tour of San Bernard Oak Trail: Reservations are not required for self-guided tours. Catch a shuttle van at the Van Stop for a ride to the San Bernard Oak trailhead. Form there, proceed on your own to the tree at the end of the trail. A trail guide can be downloaded here. Guided Tour of San Bernard Oak Trail: Reservations are required for docent-guided tours. Please sign up at the Information Booth. ​features along the way. A trail guide can be downloaded here. Binoculars, sunscreen, and mosquito repellent are recommended. The trail is 0.6 miles from the trailhead to the tree (1.2 miles round trip) through a bottomlands forest. the trail is level and has stretches of boardwalk over seasonal marshes. Marshes are common in April when spring rains encourage flowers, such as Irises, to bloom. There is a rich diversity of plants, birds, and evidence of mammals to see in this forest wetland. ​At the end of the trail, visitors will arrive at the San Bernard Oak, formerly designated by the Texas A&M Forest Service Big Tree Registry as the largest Live Oak (Quercus virginiana var. virginiana) in Texas. As of 2016, the criteria for this designation was revised and this distinction was awarded to a Live Oak in Colorado County. *Source: "Texas Big Tree Registry: Champion List for Species Native or Naturalized to Texas." Texas Forest Service.